The Stars and Stripes 5K was the last race of our M-town race series date nights. We'd already tapped out our free child care aunts so I didn't want to ask them again. And Chris had booked a teen but they couldn't get there until too late for me to feel comfortable with getting to the race on time so I canceled that. Plus, baby sitters are expensive! It adds up fast and July/August is a big date month for us because of my birthday and our anniversary. So since it was a bit hot and there was no chance of a PR about an hour before we needed to leave I decided to make it a family affair. We called a couple of friends and borrowed some jogging strollers to take the kids. Swung by Wal-mart on the way to get some flags for the kids to wave and strollers to decorate and ta-da, one cute patriotic family ready to run. Sarah is in a Bob and that thing was heavenly to push. I can't remember the brand that Cody is in but Chris really liked it as well. I'm think we may sell our current Jeep double stroller and save up for a Bob double. Red Girl Team ready to go. Well, at least I look excited. 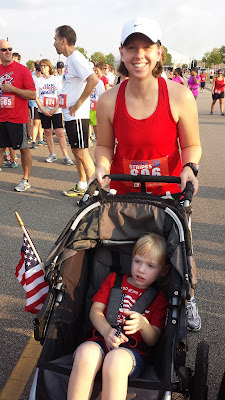 Sarah was only peppy when she was hollering for Daddy to catch up or waving at the people cheering for her. You know, because she was doing a lot of work. Blue Boy Team geared up to run. 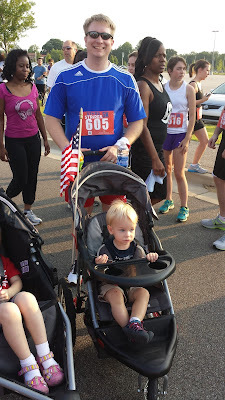 This was the first time running a race pushing a stroller. We started at the back like we were told and quickly got stuck behind a hoard of walkers. I'm a bob-and-weaver so I tried to get around them as best as possible. Chris kept getting stuck behind people and we'd get separated so I'd have to either push on without him, or come to a complete stop and wait for him. Eventually at about 2.5 miles we went our separate way and I bobed-and-weaved to the finish line. This is also not a race to try to run for PR. And I felt bad for a friend who was running it as their first 5K ever. The race started promptly at 7 and everyone set off. 0.3 miles in we come up on the train tracks and the race gets split. The lead runners made it before the train but everyone else, not so much. It took at least 8 or 9 minutes for the train to completely pass! Chris and I thought it was hilarious and we laughed a bit about how odd this was. But if you were there to PR that would have ended it. If you were there for a serious run, that could totally kill your mojo. For me all it did was make it so I had to start the whole bob-and-weave process past the walkers again once the train passed. And I ended up running someone over with my jogging stroller not once but twice because they didn't get out of the way. I did apologize and was embarrassed about it. Also another warning about trying to PR here. You have to cross a main road in Memphis. Police were directing it but racers had to be stopped to allow traffic at some points. Chris and I didn't have that problem but again, 2 of my friends who were there for a serious run both got stopped and held up for traffic to pass. In the end it was a nice relaxing run and it was fun to do it together as a family. Chris said he would love to push the kids again. He really liked doing that. (He's nuts.) 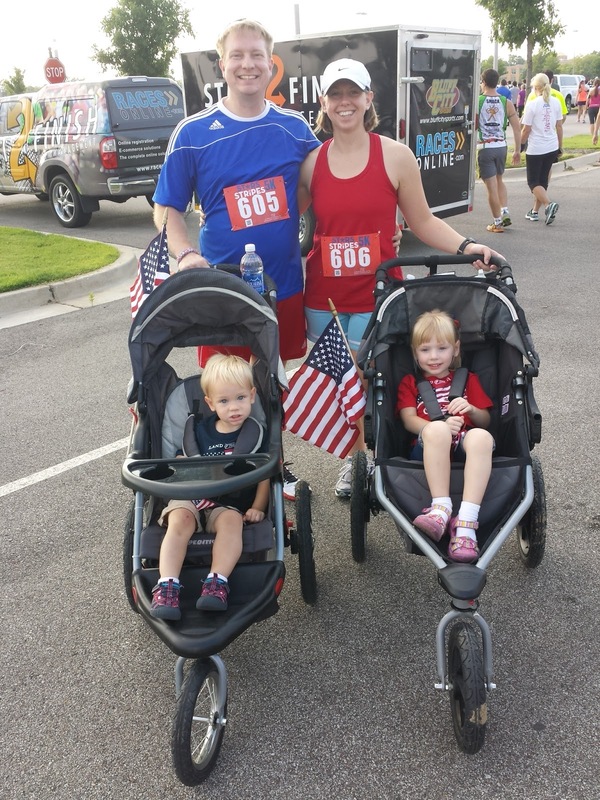 And the post race party was a great family event and a fun way to kick of the 4th of July celebrations. 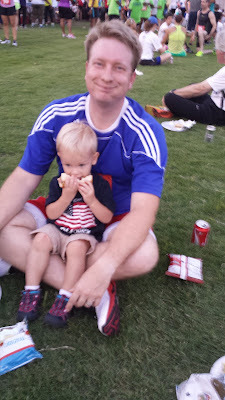 They had plenty of hamburgers, hotdogs, chips, soda, and cold watermelon for everyone. Cody kept stealing everyone else's food even though he had the exact same things on his plate. And Sarah enjoyed dancing to the band. Sorry, all those pictures were really blurry. I've got no time to report because it's not worth getting up to look at the Garmin. And my official time on the website won't be right because of the train. So let's just say I PR'd in hitting people with the jogging stroller. 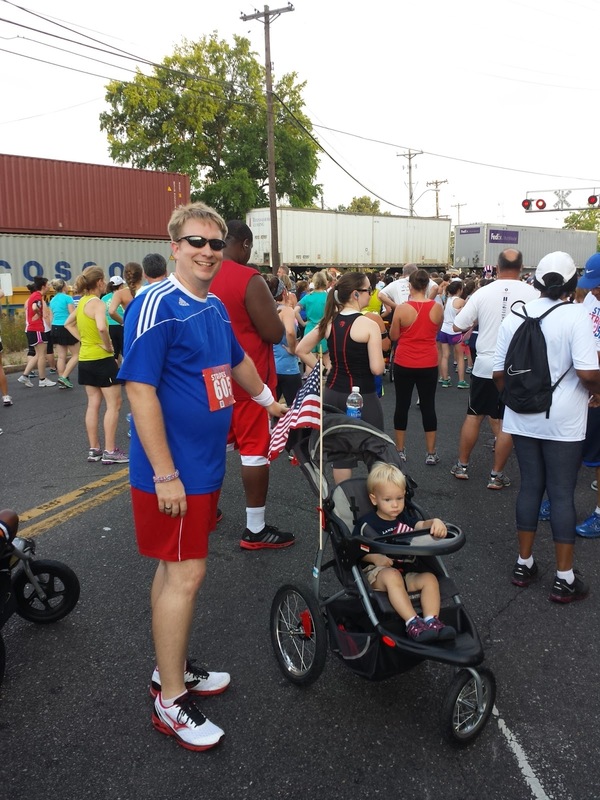 And Chris came in 1st place for cutest dad pushing a stroller. How fun! So crazy with the train and traffic. I would love a double bob jogger, too! Aww y'all are so cute! I couldn't believe that about the train. Wow. I don't think I've ever run a race that close to a busy main road ya know. For the most part traffic always had to stop for us.